Adding a class to an element in jquery is very simple. The classes can be added using addClass() method. One or more classes can be added to element. Single class can be added to multiple elements. The following example shows adding single class to multiple elements and also adding more than one class to single element. The classes can be removed using removeClass() method. One or more classes can be removed of an element.The following example shows removing single class of multiple elements and removing more than one class of single element. Above same example is modified to remove the classes. jQuery provides several methods for AJAX functionality. By using jQuery AJAX methods, we can get text, HTML, XML, or JSON from the server using either HTTP Get or HTTP Post . We can load the external data directly into the selected HTML elements of your web page. Now let’s see how we can load the external data directly into a selected HTML element of our page using jQuery AJAX methods. Make sure that you have jquery-1.8.2.js saved under the folder script. Here you can notice that when you click on Get Data button , You are getting data from myData.html. 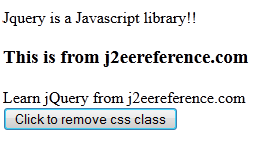 It is very easy to add css using jQuery. Lets understand this by different examples below. Here you can notice that the css is applied for all the <li>. Here you can notice that the margin and border properties are applied for all the <li>. Adding css for a particular ID. Here you can notice that css is applied for all the tags coming under the id ‘item 1’. 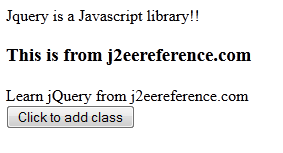 Lets see an example which will popup an alert while loading the page using jQuery. 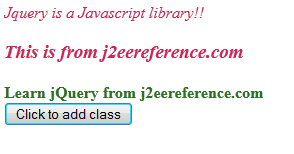 Here you can notice that we have included a java script file – jquery-1.8.2.js , Which provides many features. You can download this js file from jQuery website. jQuery provides a shortcut ‘$ ‘ for window.jQuery(“document”).ready , By which we can rewrite the code as below.